Kumaon is the part of the newly created state of Uttrakhand. It was part of the state of Uttar Pradesh prior to this and has provided a passage to the mighty Himalaya during the earlier years. Well the land has a long history and even finds mention in the Purans. The land has been looked upon as the abode of gods and other divine beings. As men have always moved in search of divine beings, so probably they landed here also. 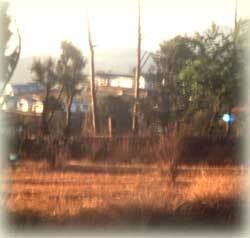 The Gurkha's also occupied the area for some time and finally the British landed there. The place still bears the marks of the rule. Presently the Kumaon region comprises the districts of Almora, Bageshwar, Champawat, Nainital, Pithoragarh and Udham Singh Nagar. Kumaon unlike Garhwal has got gentle mountains and not too deep valleys. There are no big rivers around though there are high and mighty mountains. 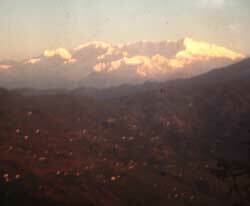 All the six districts of Kumaon have some thing or the other to offer to an adventure tourist. 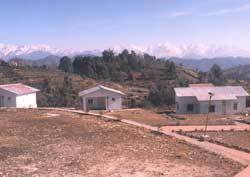 Udham Singh Nagar comprises of the tari region of the land and is the entry point to the Kumaon region. The vast tracts of green cultivated fields give no hint of the mountains in the beginning. Move in a little and the mountains start appearing on the horizon. Move on and you land up at the famous Nainital, a district full of lakes of all shapes and sizes. It has its district headquarters at the town of the same name, which lies on the hills surrounding the most prominent of the lakes, the Naini Lake. Had one moved towards the hills from Moradabad onwards to Kashipur, the most famous of the National Parks, the Corbett National Park would have been reached. The road from Udham Singh Nagar moving further in the tari region takes one towards Champawat, once the capital of the Chand dynasty. This district lies on the boarder with Nepal. The mighty Kali river forming the natural boarder. 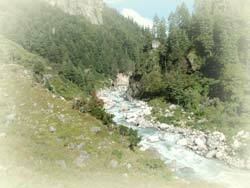 Once in the hills, the rolling gentle hills give way to the mighty Himalayan peaks and glaciers. One is always in sight of these snow-covered peaks. Drive from Nainital takes one to Almora, the heart of Kumaon. The district of Almora is a fine blend of mountain beauty, ancient cultural influences, thickly wooded forests, scenic valleys, quaint cottages, crystal lakes and fast rivers. 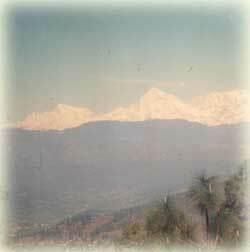 The district is adorned with garden orchards and provides a spectacular view of the Himalayas. Move closer to Himalaya and reach Bageshwar Situated on the confluence of Gomti and Surya rivers. Famous primarily for the ancient Shiva Temple, Bageshwar has its share of patriotic expressions and picturesque interludes. The Temples of Bagnath situated here is venerated by one and all. Moving on either from here or Champawat you reach Pithoragarh, which lies in the arms of the mighty Himalaya and is an ideal choice for one seeking beauty and adventure. This easternmost hill district of the Uttaranchal borders China (Tibet) on the north and Nepal on the east. Kumaon, nestled in the Himalaya, is a perfect travel and holiday destination. It has all the ingredients for leisure as well as adventure tourism. The unexplored valleys, towering peaks, foaming white water rivers, glaciers, tranquil lakes, charming hill resorts and pilgrim centers. Who has not heard of the famous Jim Corbett National Park. Kumaon is well linked with rest of the country by rail and road transport, though rail is only up to Kathgodam near Nainital or Ramnagar near the Jim Corbett National Park. The roads are narrow but well maintained and are the lifeline of the region. 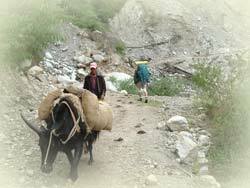 Pilgrim traffic is less in the region since most of the big pilgrim centers are located in the Garhwal region. However it has more share of the leisure tourism. Great scope exists for an adventurer here as most of the places fresh and inviting. 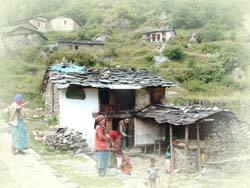 1 Dharchula Panchchuli BC (East side) 09 days trek. Details.